WindowManager is a long-standing shareware program for the Windows operating system that remembers window sizes and positions so that they are launched using the same screen position and dimensions each time. The program supports a variety of other features, from configuring custom dimensions and size to lots of triggers, hotkeys, and more. Programs that don't remember window size and position on the screen on exit or don't load them properly on next start are frustrating. I ran into an issue with Firefox Nightly recently. I run the browser on half the screen on a 1920x1080 monitor but Firefox would also load with some space between the browser interface and the taskbar, and I could not figure out why this was happening. WindowManager supports all 32-bit and 64-bit versions of Windows starting with Windows XP (including server versions). The program is shareware but you can download a 30-day free trial from the developer website. A free alternative is listed below if you are interested in that. The Windows software can remember the size and position of programs running on Windows so that program windows open always in the exact location on the screen. It is not a run-and-forget type of program though. The main interface displays the available rules on start. You can select "all windows" there to add all running program windows to the rules section to get started. A click on edit after selecting one of the programs opens the rules editor. You define matching rules -- the program matches based on window title, program file name, and window class -- the actions and advanced options. Actions define window position, size, state, and other related variables. Use the get, set and pick options, or enter values manually to get started. Get pulls the current position, state, and size and enters the values automatically. Set enforces the rules so that you can verify them. WindowManager may lock size, position and state of any window, enforce that the window is always visible on the screen (and not moved outside of it). Other options include setting the window to be always on top or at the bottom. Advanced options let you set commands that you want execute on window open and close. The commands include clicking, moving, or typing text into the window when it opens or closes. Once you have configured rules you can save them to the profile. 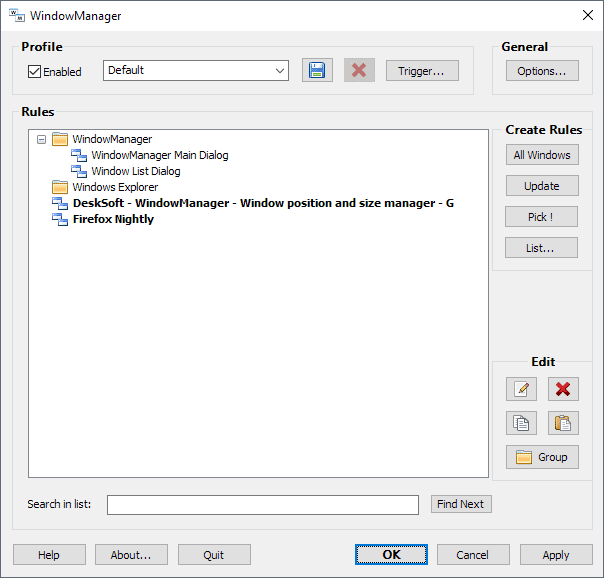 The rules are enforced automatically when WindowManager runs and matching program windows get opened or closed on the system. WindowManager supports a sophisticated triggering system to enforce rules automatically or manually. Set a hotkey for all windows of a profile or the active one to quickly enforce rules to display it in a certain position and with a certain size and state on the screen. The program supports screen triggers to apply rules when the screen resolution changes, session triggers which activate during logon, logoff, or connect operations, power and time triggers. The screen trigger could prove useful to users who use multiple monitors on their device or connect their computer to different monitors regularly. WindowManager worked with any program window I set custom rules for. It resolved the issue with Firefox on my system but worked with Windows Explorer, Thunderbird, and any other program window that I tried it with as well. It even worked with dialog windows. The program supports profiles that you can switch between and other nice to have features such as silent deployment options, or multi-monitor support. The asking price of $10 is reasonable considering that the license does not expire. You may buy the "lifetime free upgrades" to include all future upgrades; if you don't, only minor version upgrades and one year of major version upgrades are included. 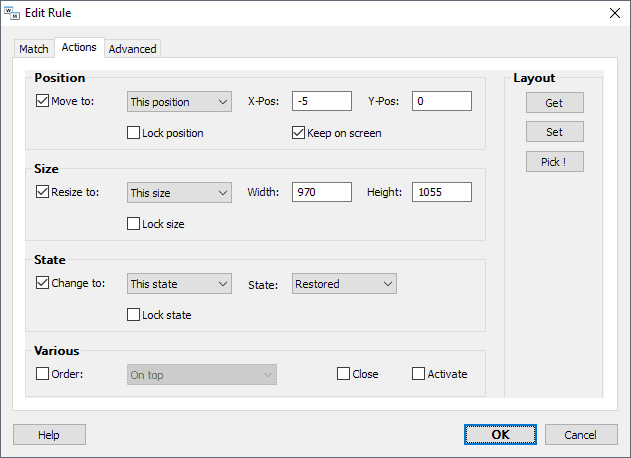 You can check out WindowPadX which supports moving and resizing windows among many other things. If it is just the window state you are after, check out Auto Window Manager instead. Very frustating I agree. But a program constantly running in the notification area that you can’t stop connecting to the internet is even more frustrating. Uninstalled. Already tested on Win 10 Pro 64-bit, but I don’t know with Win 10 Pro v1803 64-bit. I remember using it on XP and when I upgraded to Win7 it just stopped working correctly, even though you can assign a hotkey to do it, the “auto” aspect of it has been rather busted. Does not work on Win 8.1/64-bit. Works fine with 1803 x64. Is there any free tool that automatically saves and restores the window size and position? It seems all these softwares require you to specify the size and location correct? In general, the old trick still works–open any program, hold the Shift key down, resize the window accordingly, and close the program. When opened again, the general rule, is it will open exactly as one resized it. It’s an old method that I still use in Windows 10 with 99% effectiveness. All this other stuff . . . got me. I use IEMaximiser because of Windows being unable to open IE (which i almost never use anymore) maxed “all of the time”. Even Windows Explorer and Office suffers from this from time to time. Annoying to say the least. Shouldn’t Windows do this on it’s own instead of through extra software? I have been a happy camper with DisplayFusion. I am not affiliated, just a fan! It has an ability to remember things like this too. Window stuff I mean. I use WindowManager, and have done for over a year. I also use ShellFolderFix, and the two complement each other. I have felt greatly frustrated with Windows’ inability to remember window-screen positions. My impression is that this started to happen around Windows 8. Why on earth would you want to close a window, only to find that when you open it again….it appears, let’s say, at the far top left hand corner, miles away from the “central” position where you last left it? I really don’t like that!! WM works well for me mostly, and I blocked it calling home in my firewall, soon as I spotted it had that behavior. Like Anonymous, I don’t much care for that either, but so many many things try and call home, that I don’t think this is grounds for de-installation – just use a firewall block. Really annoys me that something as basic as remembering a screen position, necessitates third party software, when earlier versions of Windows, managed perfectly well in this regard. Does anyone remember “BAGS” I think it was in the Registry…..or was it MRUBAGS, that’s just from memory, I’ve not looked it up. I seem to remember XP had used up its “bags”, and started forgetting window positions once that had happened. So this has been a very annoying habit of Microsoft, for years!!! Yeah, how on Earth computer programmers, who spend oodles of time getting all these intricate features of an operating system to work smoothly, could overlook something like having the program window re-open in the same dimensions and location as it was closed, is beyond understanding. As an aside, they really can’t even get the basics right – re: window positions. And the Microsoft “store” is appalling IMO, in its’ function and design. And just look the mess and bloat that is so much of their software, .NET included. What Microsoft need to do really, is get back to simple things – jewel-like coding that is neat and pared down to the bone. Beautiful coding that respects all form and function, and just works in small, neat, (OPEN SOURCE!) packages. Dream on eh! …. that world disappeared long ago, and we are left discussing why Microsoft can’t even get something like this right. I’m wondering if WindowsManager will continue to apply a given rule if the version number of a particular application changes. I have a problem with VLC player v3.0.3 whereby the option to resize it i.e. by grabbing the botttom right hand corner with the mouse is located below the taskbar on Windows 8.1 making that option impossible. I posted the problem on the VLC forum at https://forum.videolan.org/viewtopic.php?f=14&t=145215&p=475734&hilit=Resize#p475734 but the only response has been to wait for the next update. If WM doesn’t have that ability it’ll be a waste of money. I’m a bit wary of running old apps on Windows 8.1 and ShiftWindow was released in 2013 by the looks of it. But I’ll keep it in mind, thanks. Thanks Martin, just tried it. Brilliant program, low price, does the job, will definitively purchase.